The Grind Line era of the Detroit Red Wings officially ended on Tuesday, as the famed line’s final member retired. Kris Draper announced his retirement after seventeen seasons with the Red Wings, finishing his career as one of only five players to play more than 1,000 games in Detroit. “I never thought I was gonna last this long,” Draper admitted at a Joe Louis Arena press conference, at which he thanked seemingly everyone he came into contact with as a Red Wing. Draper was acquired by Detroit from the Winnipeg Jets for one dollar on June 30, 1993. En route to the 1997 Stanley Cup Championship, he joined with Kirk Maltby and Joey Kocur to form the Grind Line, a fan-favorite group that also included Darren McCarty. Draper finished his career with 1157 games played, all but 20 with the Red Wings. He scored 161 goals and 203 assists. He also represented Canada at the World Junior Championships in 1990 and 1991, the World Championships in 2000, 2001, 2003 and 2005, the 2004 World Cup of Hockey, and the 2006 Olympics. He will take a currently-undefined front office role with Detroit. 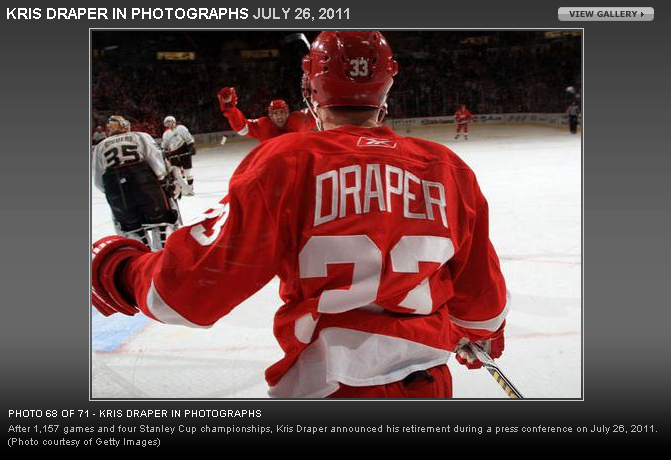 Great catch by the Winging it in Motown guys, who caught that the Red Wings’ web site posted a Kris Draper photo gallery with a caption indicating he will retire. The gallery has since been removed but I grabbed a screen shot of it. New media has tripped the Wings up before, with a third-party provider sending out the false announcement that Steve Yzerman would return from retirement in the fall of 2006. That said, while this clearly wasn’t supposed to be released yet (hence its removal) I don’t think the information is incorrect. Fewer than 24 hours after Detroit backup goaltender Chris Osgood announced his retirement, the Red Wings have found his replacement. The team announced on Wednesday that former Wing Ty Conklin will return to the team for the 2011-12 season, signing a one-year deal. As per club policy, financial terms were not announced, but the contract is expected to be worth under $1 million. Conklin was Osgood’s backup for the 2008-09 season, going 25-11-2 with a 2.51 goals-against average and .909 save percentage. He was one of several players to leave the team the following summer as the Red Wings were pressed by the salary cap, signing a two-year deal with the St. Louis Blues. Conklin struggled with the Blues and was waived during the 2010-11 season, during which he went 8-8-4 with a 3.22 GAA and a .881 save percentage. Reports out of Detroit this morning indicate that Red Wings goaltender Chris Osgood will announce his retirement today. Osgood and general manager Ken Holland will address the press via a conference call at noon today. The call was announced yesterday with no reason given. It is expected that Osgood will take a role within the Red Wings organization. Chris Osgood has officially retired. It’s been tough for me to write that. I’ve been an Osgood fan since he came into the NHL. I always preferred him to Cheveldae and Essensa, Vernon and Hasek. Jimmy Howard somehow made it past that sometimes-irrational favoritism but I prefer a healthy Chris Osgood to Ty Conklin as his backup. Osgood feels healthy today but can’t promise he would be all season. That’s why his retirement is the right call for both him and the organization. The debates will rage about where Osgood stands in relation to his peers and the NHL greats. Does he belong in the Hall of Fame?nbsp; Was he just the product of the Red Wings’ system? I’m not getting involved in that today. I’m just going to look back at old highlights and say “Thank you” to Osgood for what he did for the Red Wings. This may be the right move for the team and for Ozzie but it doesn’t feel right as a fan. The Red Wings have announced a conference call at noon tomorrow featuring Ken Holland and Chris Osgood. I have to think this means Osgood will be returning for one more season, as the team would not arrange a retirement announcement over the phone. I’ve always been an Osgood fan, from that perspective I like the move (if it is what I think it is). If Ken Holland thinks Osgood is better than Ty Conklin at this point, I trust him. There aren’t a lot of options out there right now and Osgood may very well be the best of them. As I briefly Tweeted last night, today is one of the days where DetroitHockey.Net makes me feel old. I debated letting it go by unrecognized but that hardly seems right. I started YzerFan19’s Detroit Red Wings Page – the site that eventually became DH.N – 5,419 days ago. That day – September 15, 1996 – was my 5,419th. As of today, I have officially been working on this site for half of my life. I wish I had profound things to say about the nearly 15 years I’ve been doing this. So much has changed between then and now. I’ve gone through the list before but when I started this site, Google was not yet public. The term “blog” did not yet exist. Vladimir Konstantinov was still able-bodied. Paul Coffey was still a Red Wing. It’s been a long time. I hope I’m lucky enough for another 5,419 days doing this. The Detroit Red Wings announced the signing of goalie Joey MacDonald to a two-year deal on Monday. As per club policy, financial terms were not announced. MacDonald had been expected to leave the Detroit organization as a free agent this summer. He was seeking a one-way deal in the NHL, which the Red Wings were unwilling to provide. Presumably such a deal could not be found, leading MacDonald to return to the Wings on a deal that is expected to be two-way. In 15 games last season with the Red Wings, MacDonald went 5-5-3 with a 2.58 GAA and .917 save percentage. He has played 87 career games with Detroit, Boston, the New York Islanders, and Toronto. In speaking with Red Wings blogger George Malik, Detroit assistant general manager Jim Nill called the deal, “Just a little insurance policy,” implying that MacDonald will not be the backup to Jimmy Howard this season. The Detroit Red Wings named their two new assistant coaches on Friday: Jeff Blashill and Bill Peters. The pair replace Paul MacLean and Brad McCrimmon, who both moved on to head coaching jobs this summer. The 37-year-old Blashill comes to Detroit from Western Michigan University. In his lone season with the Broncos, he led the team to the CCHA championship game and an NCAA tournament berth. Before coming to WMU, Blashill coached the USHL Indiana Ice to a Kelly Cup championship in 2009. He was also an assistant at Miami of Ohio for six years and an assistant at Ferris State for three years. He played his collegiate hockey at FSU as a goalie. Peters, 46, has been the head coach of the Rockford Ice Hogs – AHL affiliate of the Chicago Blackhawks – for the past three seasons. He was with the WHL Spokane Chiefs when Detroit head coach Mike Babcock coached the team, serving as one of Babcock’s assistants for one season. Peters later coached the Chiefs himself, leading them to the 2008 Memorial Cup.